On the day of Pentecost (Acts 2), for the first time conditions of salvation were proclaimed under the New Covenant. Three thousand responded! “Therefore let all the house of Israel know for certain that God has made Him both Lord and Christ– this Jesus whom you crucified.” 37 Now when they heard this, they were pierced to the heart, and said to Peter and the rest of the apostles, “Brethren, what shall we do?” 38 Peter said to them, “Repent, and each of you be baptized in the name of Jesus Christ for the forgiveness of your sins; and you will receive the gift of the Holy Spirit. 39 “For the promise is for you and your children and for all who are far off, as many as the Lord our God will call to Himself.” 40 And with many other words he solemnly testified and kept on exhorting them, saying, “Be saved from this perverse generation!” 41 So then, those who had received his word were baptized; and that day there were added about three thousand souls. (vv. 36-41, NASB). There were many pools right there in Jerusalem which would have been suitable for the baptism of so many, including the Pool of Siloam, the Pool(s) of Bethesda, etc. 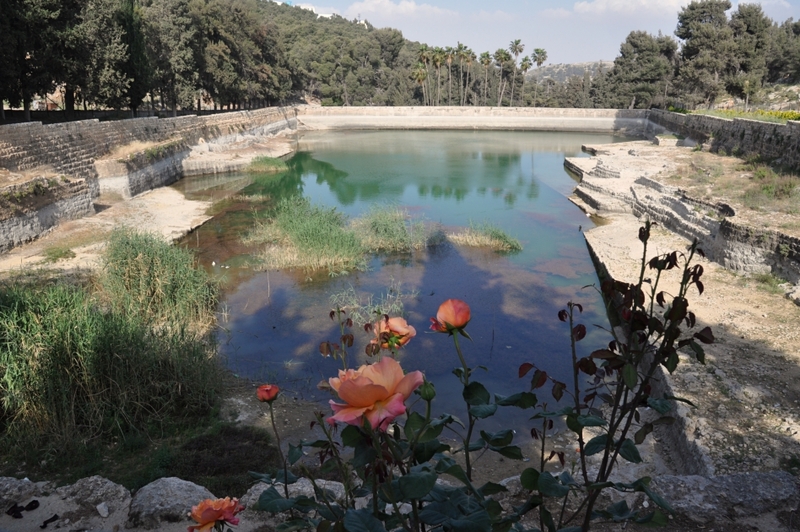 I am also mindful of “Solomon’s Pools,” south of Jerusalem, located between Bethlehem and Hebron, which were water sources for Jerusalem in the days of Jesus. “Solomon’s Pool.” The middle of three. Photo by Leon Mauldin. These three pools, the middle of which is in our photo here, were not built by Solomon, but by Herod the Great, or possibly by the Hasmoneans (intertestamental period). Pilate later made repairs to the pools. Today the pools are located in the Palestinian Authority’s West Bank. This entry was posted on Wednesday, August 16th, 2017 at 5:02 PM and is filed under Bible History and Geography, Hebron, Israel, Jerusalem, New Testament, photography, Travel, West Bank. You can follow any responses to this entry through the RSS 2.0 feed. You can leave a response, or trackback from your own site.